The Kafka Hotel consists of two buildings facing each other across the street. The main building has a basement plus three storeys, a reception, breakfast room and a yard with parking. It has no elevator. The dependence of the Kafka Hotel is across the street, facing the main building. It also has three storeys and no elevator. The non-stop reception offers hygienic aids, beverages (beer, wine, soft drinks) and snack such as wafers, chips, bars and chocolate for sale. 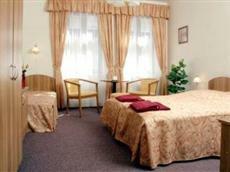 The hotel accepts payments in CZK, EUR and credit cards MC, VISA, AMEX, Dinners, JCV. You can use the hotel's exchange office. The hotel allows dogs and pets for the fee of EUR 6 per night. In the reception you can borrow a hair dryer, electric kettle or an iron. The clients can use a wireless internet connection in the hotel reception and in some rooms, free of charge. The guests can also rent a safe in the hotel reception to store their documents and valuables. The reception offers and arranges transfers, folklore evenings, boat cruises with program or without program, Prague sightseeing, tickets to theatres and museums.